Ronnie has been passionate about fitness since youth where he excelled in sports and played high school, college and semi-pro football. 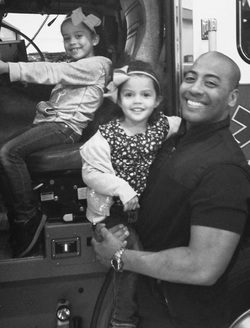 After serving in the Marine Corps, Ronnie worked as a personal trainer while he pursued a career as a firefighter. He has currently worked as a professional firefighter for the last 6 years. Aside from being a CrossFit coach, Ronnie serves on the Peer Fitness Team at Central Pierce Fire Department and mentors high school athletes. It was important for Ronnie to develop a gym within the local community designed for all skill and experience levels that is non-intimidating, positive, and family oriented. Ronnie strives to help people transform their overall health and discover their athletic potential as well as help young athletes prepare for college or professional sports. Ronnie has his CrossFit Level 1, Level 2, CrossFit Football and CrossFit Kids, USAW (USA Weightlifting Certification) certifications, Kabuki Strength certification and is CPR/AED certified. In October 2014, he attended an intense 3-day Outlaw Way Camp which provided in depth training on coaching Olympic lifting, gymnastics, conducting strength & cardio vascular testing and programming. Ronnie and his wife Melissa have two young daughters, serve at their local church, and spend as much time possible outdoors enjoying all the Northwest has to offer.